Prior to the winter of 2016/2017 Lake Tahoe, and California in general, has been experiencing a major drought. Last winter was the biggest winter we have had in years and the wildflowers in the area this summer have been fantastic. The nice thing about living in the mountains is that you don’t really have to go anywhere to experience the summer color. 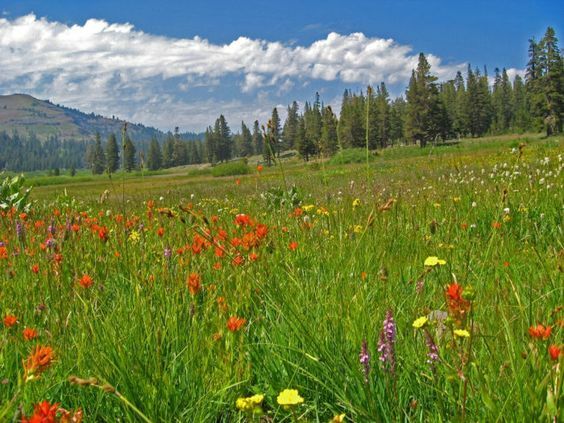 The meadows at lake level tend to bloom in early summer while the meadows in the higher elevations bloom late in the season, but if the winter was heavy and the spring wet, there are plenty of flowers to be found right up until the leaves change color in the fall. For those who are willing to take a long trek into the higher elevations, the flowers are simply spectacular. I hope you enjoy this selection of photos brought to you by me and my friends. 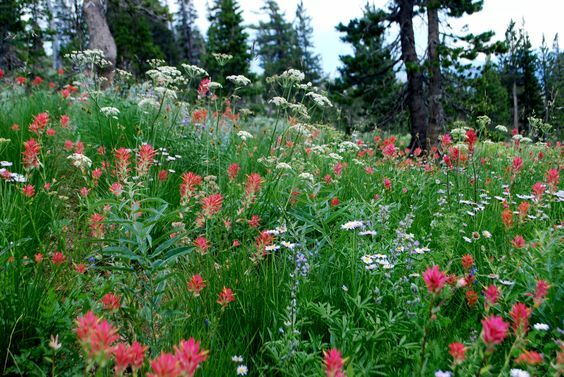 Comment below and let me know if you live or have ever lived in an area with an abundance of wildflowers during the spring and summer in order to be entered to win a $5 Amazon Gift Card. The winner of the gift card from last week was Candy Kennedy. Please email me at kathidaley@kathidaley.com to collect your gift card. ← Did Someone Say Back to School? I grew up in Western Pennsylvania, and we enjoyed lots of wildflowers. I live in South Central Texas, when we have the rain we have lots of flowers. The last couple of years the rains have come at the right times. Your pictures are beautiful. I’ve seen wildflowers in passing and I actually have a few packages that I hope are still good. Here in the south you see beautiful wildflowers all spring and summer. They usually start in late January with spider lilies, then in February, johnquills and others bloom. So we have beauty all spring. Although I live on a farm, I don’t see too many wildflowers. Your pictures are beautiful! I live in North Texas and most years we have lots of wild flowers, especially Blue Bonnets. I live right near The Cape Cod National Seashore and they have huge fields of wildflowers growing everywhere. The colors are beautiful. Monk daisies are everywhere and Ladyslippers peek out every now and then. There are wild flowers in different parts of the state but in my area I don’t see them unless flowers are intentionally planted. Great photos. 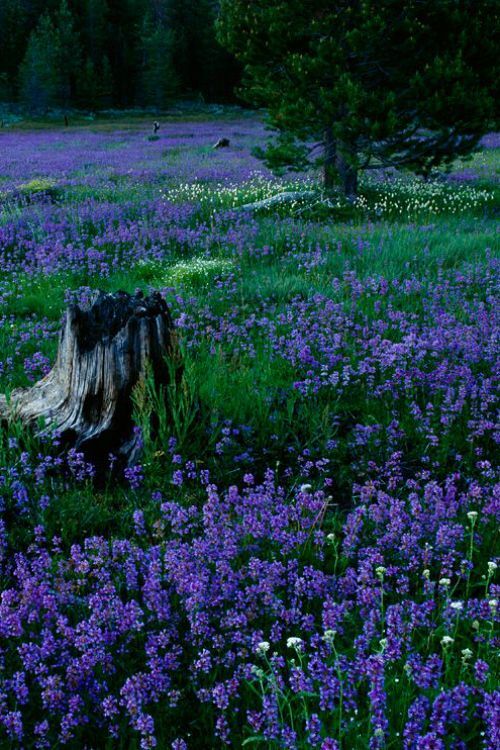 I like the blue/purple flowers. We have masses of beautiful bluebonnets in Central Texas in the spring. 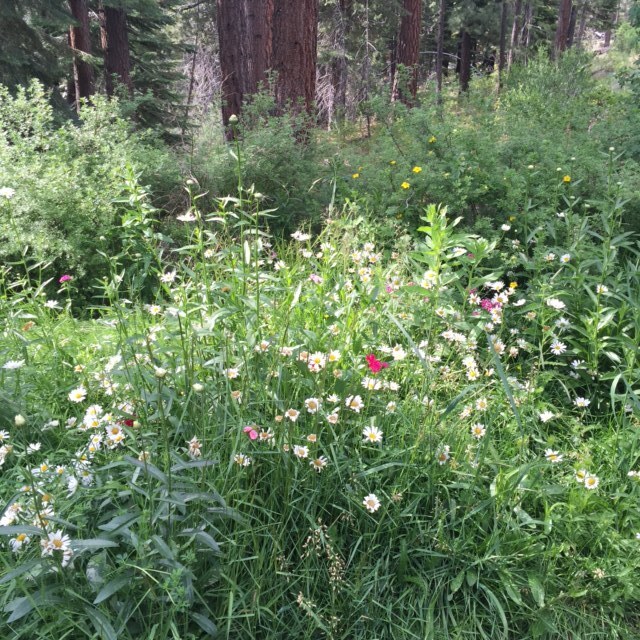 I live not to far from Kathi and I saw a field of wild flowers on a trip to Lake tahoeI I happen to live near a huge vernal pool on land that hasn’t been touched for many many years. It only last for a few weeks and you have to go in with guides. The more rain, and we had a lot last season. the pools are ringed with flowers and critters not often seen. The fun way to go is by an old fashion steam train that brings you close to the fields to be met by guides. We also have lots of fields of lupine, California poppies and daffodils. . I have never lived anywhere near such pretty flowers like you’ve shown. Totally awesome. But I have to say, my mom had so many flowers in her backyard, it was amazing. She had snapdragons, carnations, roses, daffodils, tulips, and lilacs and probably more that I can’t remember! Even the people who later purchased the house commented on the flowers. I live near the mountains also, Jasper national park, and we are always treated to amazing wildflowers. I’d have a very hard time leaving all the scenery behind! We live in a rural area and there are tons of wildflowers. Plus we save the seeds from some of the wildflowers and plant them in areas where flowers don;t grow. In fact my husband planted a row of sunflowers in his garden which is too far for me to get to. The end row which i can see from the living room is a row of wildflowers. A few years ago he started throwing seeds on the driveway which is windy and about 1/4 mile down the hill. Now when my mom (friend) and others come up they love it as they call it the Wildflower Lane. There are just so many different wildflowers growing and it is so pretty when I go down 2 times a week, Wednesdays with my mom then to church on Sundays we go slow going up and down so i can see all the colors. Then he planted wildflowers and sunflowers around our mailboxes and it is so pretty. I just love it and that was his purpose,He is very thoughtful that way which makes up for his having no patience! That I tease him about all the time and he knows it but he is working on that. Because we had a dry winter, our wildflowers were somewhat less than spectacular this year. But those that did bloom were lovely! Yours were gorgeous and you earned them! Growing up in PA I laugh now, at the bottom of our street was a field and all the flowers that I thought were so pretty my mother called weeds, now they are wildflowers. I don’t see too many here in TN, but I’m sure there are some in the Park near here but it is too hot to go see. We did drive down to see a friend in Texas years ago, I was amazed at all the wildflowers along the side of the roads there absolutely beautiful, I just wish that we had been there a little earlier to see the Blue Bonnets, I hear they are amazing when they bloom. We have plenty of wildflowers in our Pennsylvania area. We used to see acres of wildflowers as they bloomed in pastures and around the edges of crop fields. Not many now but sometimes we find an area still filled with them. I was raised in Chicago before all of the locked in land development. Our house was one of 3 in a 4 city block, undeveloped area. We were surrounded by natural prairie and wildflowers (plus the f!users and garden my parents and grandparents grew. That all disappeared by high school. Now the only areas with natural prairie and flowers are protected regional parks and small regions still designated as forest. I visited Texas one summer to see my dad and the wildflowers were spectacular! I live in the suburbs of Chicago and we don’t have many wildflowers in our area. I wish we did, they are beautiful. I’ve lived in mostly rural areas during my lifetime in both Connecticut and Massachusetts and there were ample Read of wildflowers to enjoy but nothing compared to your puctures. Perhaps it is our very rough winters, some years with snow on the ground from October until May that keeps the wildflowers from being as prevalent here. 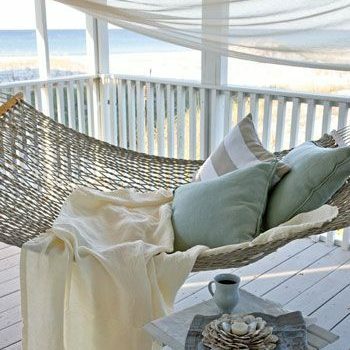 I surely do enjoy seeing the ones we do have especially those near the beaches in Cape Cod and other coastal New England areas. I have never lived in an area like that! I live in a place where I can go to the wilderness (though the snow levels are still low in some places!) and enjoy wildflowers all summer! !